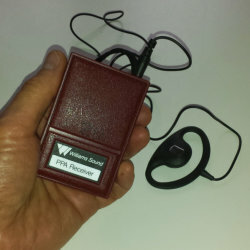 Today many theatrical companies engage the services of trained audio describers to enhance the theatre experience for people who are blind or have low vision. The describer occasionally speaks "between the lines" to describe entrances, exits, actions, and key props to people who cannot see them. Often, before the show and during intermission, a describer "sets up" for the performance by detailing the stage layout, props, characters, and costumes. There is never any charge to the theatre patron for the use of audio description, although the theatre may pay a fee for the service. The typical scenario for using description would be to locate a table in the theatre lobby where description equipment is being handed out. You will usually be given a small hand-held receiver about the size of a pack of cigarettes. It has an on/off switch, a volume control, and a jack for a headset, which you will also be given. Headsets vary in style, and you may even prefer to bring your own. Put the headset on and turn on the receiver as soon as you get seated, as you may find someone is describing the stage or characters for you already. See Also: I love theatre and I'm blind. Here's how that works. And: Why Go to See Live Theatre if You are Blind? If you don't find description offered for a favorite theatre or for a specific production that you would like described, call and ask for it! The theatre will be dependent on finding local audio describers -- not always an easy task -- but there is no harm in asking. Advocate for your own needs! Under the ADA, offering an accommodation is always on a case by case basis, and the decision is based on what is "readily achievable." That will vary from one venue to another, of course, according to administrative and financial resources. A large theatre organization will be a much more likely candidate for offering description than a small one, for example; and you must also take into account whether or not audio describers are available in the area. Each venue should develop a policy in accordance to what is readily achievable for them; then they should market their policy so that the public knows what to expect and how to request the service. Disclaimer: Theatres listed here have been reported as offering audio description at some performances. CALL the theatre to request or verify availability of description! - Theater Works performances, described by The Visual Voice. Tell the box office you want "Visual Voice" tickets to get a discount. Colorado Ballet Audio described performances are available at a discount! Follow the link. The Denver Center for the Performing Arts, Denver, offers accessible services including audio description for their Broadway Touring shows and Regional Theatre Company. Visit Audio Description Colorado for the complete listing of theatres currently using audio description. For additional information (including a schedule) about audio described performances in the DC area, visit The Washington Ear and/or DC Arts & Access Network Calendar. Arena Stage offers audio description at selected Wednesday evening and Saturday matinee performances as noted on their season calendar. 202-554-9066. The John F Kennedy Center for the Performing Arts provides audio description and referrals to accessibility services and accommodations. 202-416-8727; access@kennedy-center.org. Alliance for the Arts, Fort Myers, offers audio described performances. Broward Center for the Performing Arts in Fort Lauderdale offers audio described performances and training for describers. Florida Repertory Theatre in Fort Myers is offering AD for its Mainstage productions. Steppenwolf Theatre Company in Chicago offers "Audio-described performances, touch tours and pre-show artistic conversations for people who are blind or have low vision; Audio recordings of programs; Braille and large-print programs." 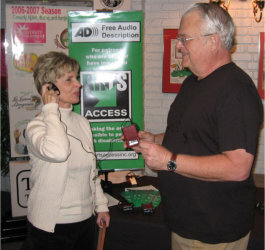 The Victory Gardens Theater in Chicago offers audio description (plus touch tours, Braille and LP programs) for about a half dozen performances per season via the Access Project. The touch tours are extensive, including a tactile model of the stage and meeting the director and cast. See also Robert Kingett's reviews of audio described live theatre in the Chicago area or subscribe to the RSS Feed. Indiana Repertory Theater (IRT) offers regularly scheduled AD on the same weekend as ESL (sign language). Clowes Hall, located on the campus of Butler University, offers a variety of performances, including ballet from the university and a Broadway series. The Children's Museum occasionally offers AD. Des Moines Performing Arts offers AD for their Broadway Series. DC Arts & Access Network Calendar. Center Stage describes one Sunday matinee and one Sunday evening performance. 410-332-0033. Contact alawson@centerstage.org. The Kalamazoo Civic Theatre. Read this article on how the AD program got started. Audio Description in Omaha and Lincoln is provided by Outlook Nebraska (check for details) at the venues listed below. Read about the D-Scriptive service available at every performance of select Broadway productions! And here's an article on the D-Scriptive service. Geva Theatre Center in Rochester offers audio description of some performances. Blumenthal Performing Arts Center (BPAC) provides audio description during the Sunday matinee performances of its Broadway Lights Series. Trollwood Performing Arts (218-477-6502, trollwood@fargo.k12.nd.us). Large Print programs available by calling ahead. One performance of the summer musical is audio described, as are occasional theatrical performances at local universities when requested. SEE ALSO the listing for Minnesota. VSA Ohio maintains a calendar of accessible events on their website. They also host the ReelAbilities Columbus Film Festival. Contact by phone 614-241-5325 or email info@vsao.org. Benjamin and Marian Schuster Performing Arts Center, Dayton, 937-228-3630 or toll free 888-228-3630. Includes Dayton Philharmonic Orchestra, Dayton Opera, Dayton Ballet, and Victoria Theatre Association. CAPA (the Ohio Theatre, the Palace Theatre, the Southern Theatre, the Riffe Theatre Complex, Lincoln Theatre, McCoy Theatre, Drexel Theatre). Contact Elena Perantoni with requests for audio description by phone (614) 719-6696 or email eperantoni@capa.com. Three movies are live audio described during the CAPA Summer Movie Series. The Ohio State University Department of Theatre: Audio equipment with oral description of the performance for the visually impaired is available on the first Saturday matinee of each Thurber Theatre and Bowen Theatre production. Seats and the equipment must be reserved one month before the performance date. Please contact the box office at 614-292-2295 for details. The Wexner Center for the Arts: Contact Helyn Marshall by email hmarshall@wexarts.org. The Tennessee Performing Art Center in Nashville has been supported financially by the Mid-Tennessee Council of the Blind to allow audio description of various performances at discount prices for members. NOTE: Audio description in the Austin area is generally provided by VSA Texas. View their schedule of Austin events. Described performances include operas, ballets, musicals, and plays. Houston Grand Opera was the Houston pioneer in audio description, offering service on 48 hours' notice for all performances since 1987. The Rep provides audio description for each Quadracci Powerhouse and Stiemke Theater production. For information, see the website or call Erin Burgess at 414-290-5346. The Marcus Center for the Performing Arts provides audio description for select performances, including the Marcus Center Broadway Series 2pm performances on Saturdays. Wausau Community Theatre in Schofield provides audio description and touch tours on stage before each show as part of their Sensory Program. They also provide Sensory services to five other local arts organizations. Email the Sensory program coordinator or call (715) 370-2694.